Is the future of marketing to teens automated? Today candy brand Trolli is launching a Facebook Messenger chatbot that it hopes will open up a new way to talk to millennials. The chatbot is powered by Facebook Messenger and uses a series of interactive quizzes, GIFs and prizes to keep users playing with branded content. According to Rob Peichel, vp/group creative director at Trolli's agency Periscope, the idea is to gamify the conversations that teens are already having with their friends on messenger apps. "Our audience and fans are deeply into messaging apps, so if you can have a conversation with Trolli, that kind of engagement is so much more valuable than just an impression," he said. The bot uses a 10-question personality quiz to match up consumers with one of three "personalities" based on flavors of candy—dubbed "egg," "crawler" and "blast." Each personality serves up different pieces of content. 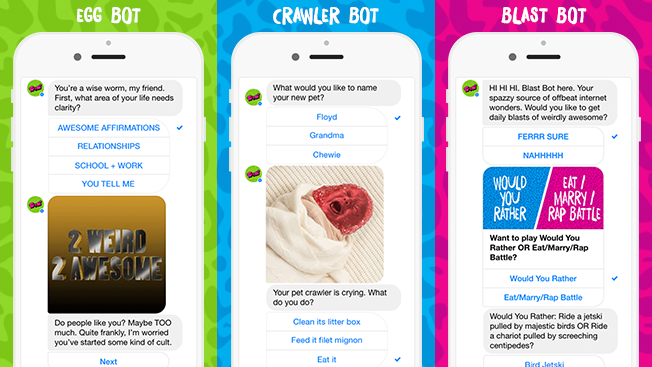 The "crawler" chatbot, for example, asks consumers to care for a virtual crawler—similar to the popular Tamagotchi toys from the '90s. The bot will push notifications to consumers via Facebook when it's time for them to feed or pet their digital creature. Meanwhile, the "blast" bot spits out memes and GIFs to "give you a daily blast of weird," said Peichel. And the "egg" bot serves up bits of "scrambled and off-beat advice" to users. Periscope is using ads on Facebook and its other social channels to promote the chatbot and will also reward consumers who answer questions with prizes like candy. If someone answers a question, the chatbot will push out a link to form on the brand's website that consumers can fill out to have a bag of candy shipped to their home. Off-kilter memes and GIFS have been a big part of Trolli's marketing for the past few years as part of the ongoing "Weirdly Awesome" campaign. Transitioning the campaign to Facebook Messenger, "gives us a whole new way to engage with our customers in a conversation and keeps Weirdly Awesome interesting," noted Periscope's chief creative officer, Peter Nicholson. "It's not unlike a video game experience."